The ability to accept multiple payment methods within Sage 100 is an important option for keeping and attracting customers. Sage 100 has always supported cash payments against invoices but this requires that you wait for your customer to mail in a check which can cause delays and cash-flow problems. With later releases, the ability to accept credit cards is built into the software. Without requiring any additional module to provide the ability to process card transactions. Sage 100cloud natively supports the following types of credit card transactions from within Sage 100 and Sage 100cloud. The Sage 100cloud paperless office capability enables you to send invoices directly to customers via email as a PDF attachment. While this can greatly save on the cost of postage it might not speed your time for collecting payment. Sage 100cloud supports several credit card providers. One popular credit card option is APS Payments. APS Payments integrates fully to Sage 100cloud, utilizes a secure payment vault and also allows for level 3 processing. When APS Payments has been installed as your credit card processor you’ll also be able to configure the delivery of emailed invoices to also include a special link that your customer can click and submit a credit card payment. Once installed (see this link for a copy of the guide) , there is an option within the company maintenance screen to enable APS ClickToPay. 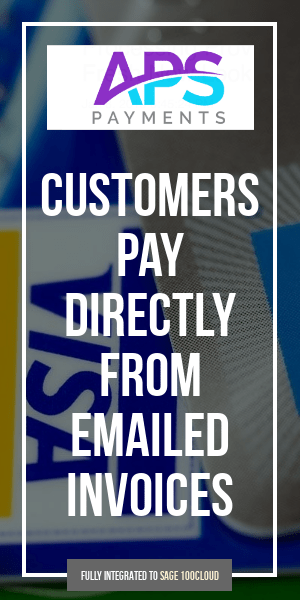 Then you only need to modify your paperless office invoices to add a link for the customer to click and pay your invoices upon receipt in their email. Do this by modifying your Crystal Reports invoice form. There are two included samples to use as guides. D531_C2PLinkCode which identifies the invoice to the gateway. Not normally used in forms, but included for special reporting. D531_C2PUrlLink which contains the full URL to link for the invoice on the gateway. This field is the one the customer will click on and is therefore critical. D531_C2PCustomer which allows you to suppress the URL if the customer is opted out of APS ClickToPay. The guide (copy here) walks you through the setup of the form, including how to suppress the button should you have customers that you do NOT want to offer the APS ClickToPay option. The opt out ability means that you could implement APS ClickToPay for every one of your customers or you could implement it only for customers who has requested it (and opt-out the remainder). The choice is yours. An update to the popular DSD InstaDocs enhancement for Sales Order allows you to send Paperless Office invoice emails along with any file attachments specific to that invoice. Perfect for safety sheets, warranty information or anything additional you might need to send along with an invoice as an attachment. If you are accepting credit cards with your Sage 100 or Sage 100cloud accounting software then you’ve likely been asked by customers whether your terminals support the new EMV credit card security. EMV cards are smart cards (also called chip cards or IC cards) that store their data on integrated circuits in addition to magnetic stripes (for backward compatibility). These include cards that must be physically inserted (or “dipped”) into a reader, as well as contactless cards that can be read over a short distance using near-field communication (NFC) technology. Payment cards that comply with the EMV standard are often called Chip and PIN or Chip and Signature cards, depending on the authentication methods employed by the card issuer. The integration of credit cards offered by Paya eliminates re-keying and is fully supported by Sage 100 and Sage 100cloud across all supported version. 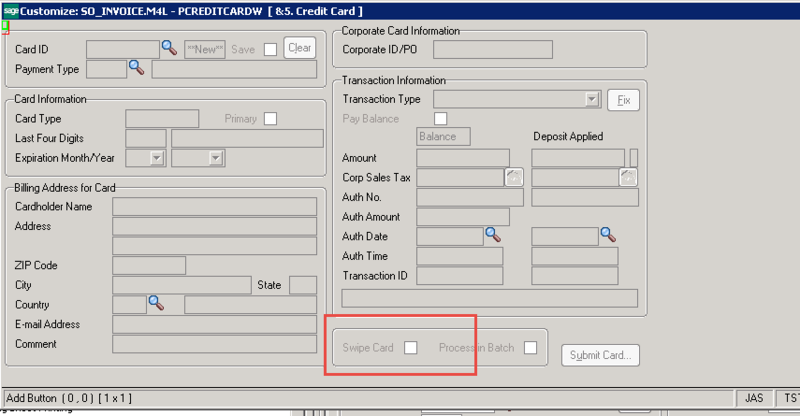 The question of how to enable credit card swipe readers within Sage 100 ERP 2013 recently was asked in my 90 Minds group. As you may know one of the big features of the Sage Exchange integration with Sage 100 ERP 2013 is the ability to swipe credit cards natively through the software. 1. 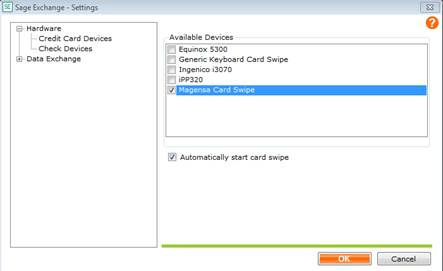 Within your Sage Exchange program (which should be minimized in the task bar and activated by a right click and clicking settings) enable the Magensa Card Swipe listed under Credit Card Devices. Your Sage Exchange interface will reboot an you will then be able to swipe credit cards in your Sage 100 ERP Sales Order module. Confused how the complicated, ever-evolving credit card payments industry works? You’re not alone! Whether you are currently accepting credit card payments or considering it, it’s critical you understand the ins and outs of the payments industry so you know what to look for in a payments solution. Not making an informed decision can be a costly proposition. • All the different people involved with moving and handling transactions. • What the difference is between integrated and nonintegrated payments solutions. • How to get started.